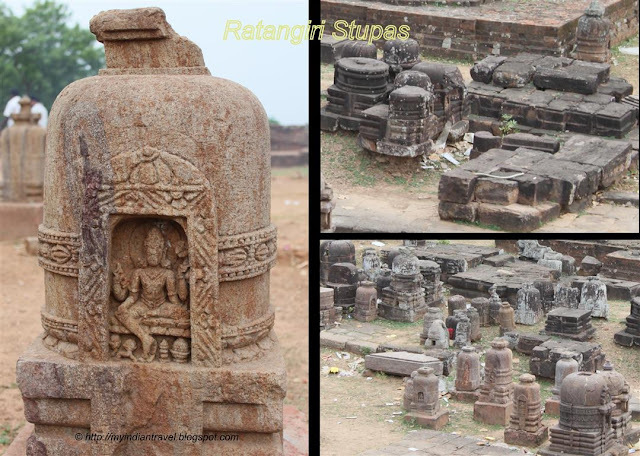 The excavation conducted by Archaeological Survey of India at Ratnagiri have yielded various interesting structures of the during the reign of the Gupta king Narasimha Baladitya in the first half of the sixth century CE. These structures were built till 12th century CE. One among them is Stupa No 1 located on the south-western flank of the highest part of the hill. This large brick stupa has a 47 feet square base with a height of 17 feet. Sadly the superstructure is missing and it consists of five recesses and six projections. It is surrounded by a large number of votive Stupas of varying dimensions. There are hundreds of miniature votive stupas decorated with lotus petals and beaded tassels. Wonderful place. Thanks for the post and pics. Awesome carvings and interesting structures! What an amazing place to discover, those votive Stupas have such history within them what stories they could tell. Thanks for taking us to such an incredible place on Mosaic Monday this week. All very interesting. Thanks for sharing. I don't remember seeing pictures of the miniature carvings before. Beautiful to see. Amazing architecture. Such hard physical labor to build them. There's definitely a sense of history in these old structures.